National Cowboy and Western Heritage Museum contracted with B.R. Howard to assess their entire collection consisting of several hundred small and large bronze sculptures located within the museum and the grounds surrounding the property. 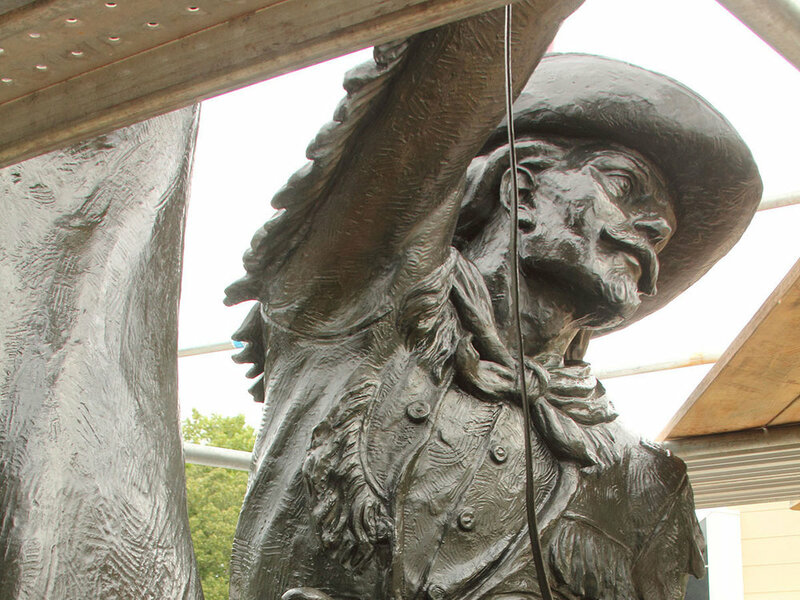 The bronze, 33’ tall Buffalo Bill sculpture was a high priority piece that the museum wanted to have conserved. First, scaffolding was erected and an inspection of its condition and photo documentation soon followed. The sculpture was repeatedly washed with water mixed with a dilute detergent and dried with lint free cloths. Small holes in the bronze had formed in an upper portion of a leg on the horse that were associated with brazing fabrication techniques and vitreous casting material was visible. These areas were mechanically cleaned, stabilized, filled, and toned to match the adjacent patina finish. Other areas on the base, saddle, gun barrel, arm and face where copper corrosion products had discolored the original appearance were reduced and locally re-patinated. Samples sections of wax coatings and lacquers were provided to the client as requested with the pros and cons of each. The hot, windy conditions would have been problematic for any spraying to occur. Therefore, applying multiple coats of the selected lacquer with a brush offered more control for even coatings. After the lacquer had cured, 2 cold wax coatings were applied and buffed between the coats. A full treatment report, including before and after images, was provided to the museum upon completion of the project.